Unionizing is not for the weak. It requires a strong advocate who is willing to quietly engage their coworkers as a leader for the movement of social justice. It takes patience, persistence and perseverance and most importantly, the backing of a team and a family. That’s where Teamsters Union 987 comes in. We’re on your side. An advocate who is willing to quietly engage their co-workers as a leader. A leader for the movement of social justice and to organize and educate on how to join a union. It takes patience, persistence and perseverance and most importantly, the backing of a team and a family. That’s where Teamsters 987 comes in. We’re on your side. Outside of work, call or email a Teamster 987 organizer. They will advise you as to whether this your industry or workplace is within the appropriate jurisdiction. When your Teamsters Union 987 organizer has given the go-ahead, a group of trusted co-workers will gather to discuss their desire to bring a union to their workplace. This will be the core committee that plans and executes the organization strategy along with the Teamsters organizer. The group will then discreetly (outside of work) find other co-workers that work in varying job roles, and in some cases, in different departments, to make sure they are reaching enough interested employees. Depending on the plan the Teamsters Union 987 organizer and committee have set forth, there will likely be a petition or membership cards that circulate (again, outside of work). These membership cards are strictly confidential, meaning employers are never allowed to see them. 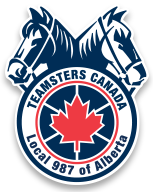 When a certain percentage of employees in the unit have signed, your Teamsters Union 987 organizer will then file the signed membership cards with the appropriate labour board (depending on your industry, either the Canadian Industrial Labour Board or the Alberta Labour Relations Board) along with an application for certification. In most cases, there will be a secret-ballot vote open to all employees affected by the decision to unionize. This is again completely anonymous and confidential; employers will not be able to see how any employee has voted. Depending on the labour board, there are exceptions as to how many signatures are required to avoid a vote and receive automatic certification. Once the bargaining unit has received certification, it’s time to go to work to set up a collective bargaining agreement. This will involve a committee of employees, the employer and your Teamsters Union 987 Business Agent sitting down to negotiate the best deal possible for you.